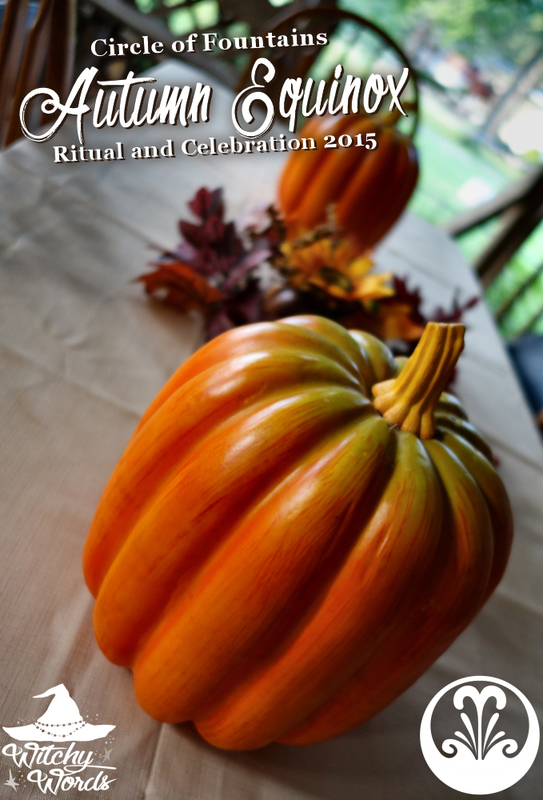 This post will cover the Autumn Equinox ritual and celebration held by the Circle of Fountains. 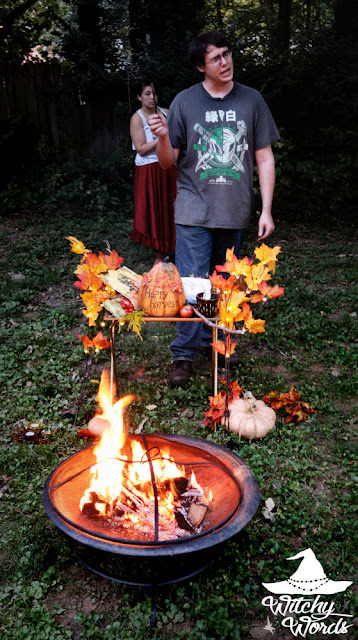 My Autumn Equinox altar is coming soon! For all Autumn Equinox related posts, click here! 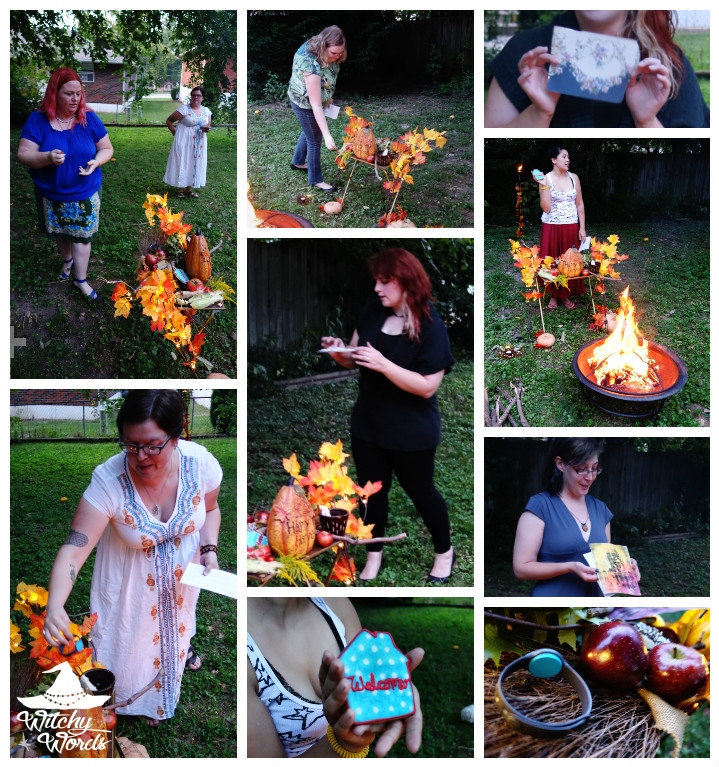 The Circle of Fountains Autumn Equinox ritual was written Jessica this year! 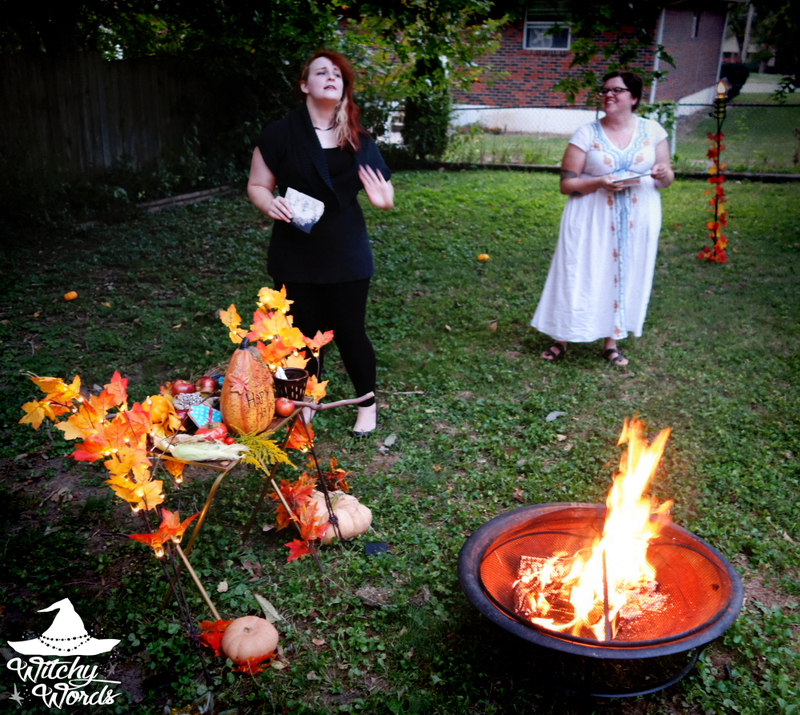 Jessica is the other founding member of Circle of Fountains along with myself and has had extensive experience leading rituals as she was a member of the prior circle as well. The equinoxes represent balance, with the equal length of day and night. However, after the autumn equinox, the days grow shorter and the cold sets in. As the second harvest sabbat, this is the equinox of things coming to fruition, of gratitude and abundance. Because the following sabbat is Samhain, the Witch's New Year, this sabbat represents the completion of one year and thus harvesting the seeds we have sewn. These awesome oil burning torches in the appropriate colors for each direction! Plus we now have a fire pit! So there's also that. The ritual began with Tony walking the circle clockwise while chanting the opening words. He carried a smoldering stick that let off smoke to protect the newly formed circle. The other members then called the corners. The ritual began with building the altar. We first brought items from our garden to add to the altar, such as flowers, pumpkins, apples and more. These natural items coincided with pieces of projects we had been working on that were nearing completion. Members brought items to represent exercise and health, creativity, and new home ownership. Because we were currently going through major issues with our house and negligent damage from the owner, Tony and I brought items that represented things that we would like to progress a little faster. Seems it worked, because we're now moving again after 30 days of living here. 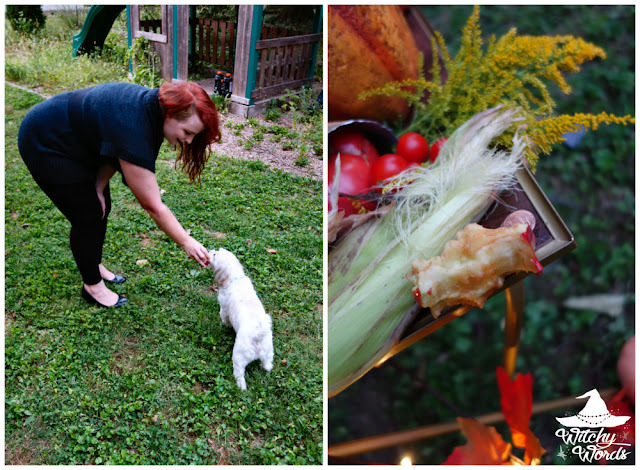 My dog Artemis even contributed to the altar as he ate the last of the apple bits from the apple I had been working on during the start of ritual. I know it's uncouth to eat out of turn during ritual, but I was famished and frustrated, and the apple helped me feel better. Artie's completion of it mirrors how much my familiars complete me. I felt like they should be represented on the altar as well. And thus the altar was complete! 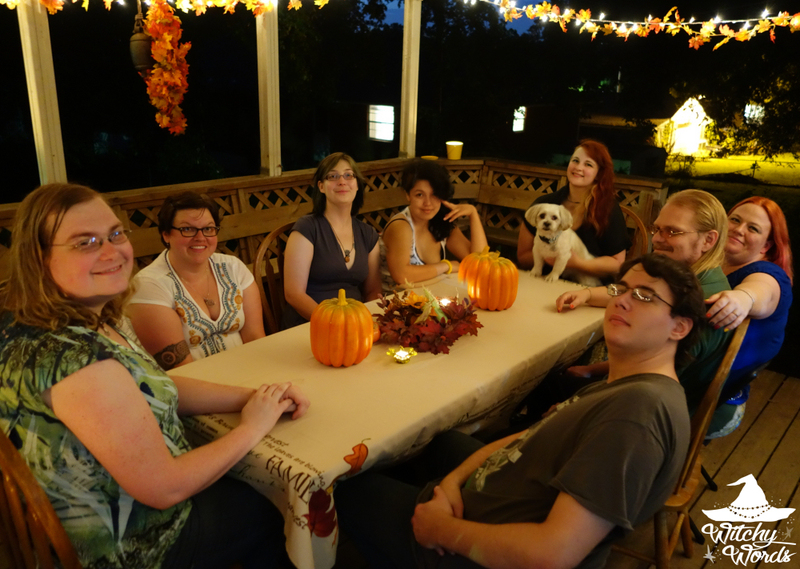 Every year around Mabon, our circle raises money for what would go to Samhain to donate to a special cause. Last year, we donated to a member in need and to help coven Liithi Lushede reach 501(c)3 status as they lead the public ritual. This year, Liithi Lushede high priestess Gwenhwyfar Wyrrd has been experiencing financial difficulty after sustaining a dog bite and the resulting medical bills. She's been through quite a lot this year, as many of the KC pagan community has, but she and her coven lead the public rituals for the community and hold one the largest gatherings for KCWMU. So this year, Circle of Fountains raised an astounding $160 (not too bad for our tiny group!) to donate to her cause. If you would like to help the high priestess of Liithi Lushede get back onto her feet after medical complications from a dog bite, you can donate here. Even if you only have a few dollars, please consider it! She hasn't quite reached her goal yet. In addition to donating, each member of Circle of Fountains brought 4 quarters with them. Jessica asked us to charge them with the idea of prosperity and abundance. I pictured money just raining down on Gwenhwyfar, as did many of our members. Others pictured a tree of money growing up into the sky or money being passed to her from all directions. We then placed the charged quarters in an offering bowl. Along with a candle, Jessica gathered them and gave them to fellow CF member Phaedra who would be seeing Gwenhwyfar over the weekend. We requested that she only spend the money on what she needs as to generate more money going to that cause. But Gwenhwyfar wasn't the only one getting little bags of precious items and candles. Jessica put together a gorgeous little bag of stones and candles for each of us! Each bag had a different meaning and use, and we were to draw randomly out of the selection to let the universe decide what we needed. Thank you so much for your amazing gift to us, Jessica! That completed our equinox ritual! Each member said their farewells to the quarters. And I walked the perimeter of the circle counterclockwise with the stick, which was completely out now, to close the circle. Our harvest altar came out splendidly! Thank you to Jessica for her wonderful ritual! Afterward, we headed up to my deck to enjoy dinner outside for the harvest. Apple and goat cheese salad (my contribution), pan-seared chicken breast with skin (via my husband), corn casserole (Kira), ginger carrots (Andrea) and squash soup (Phaedra). Our dessert was tart roasted apples (Kolika) with a delicious vegan chocolate pudding (Andrea). Our dining lasted long into the night, wrapping up just around midnight! What a fantastic celebration! And that concludes the Circle of Fountains Autumn Equinox ritual for 2015! To see the previous sabbat, August Eve / Lughnasadh / Lammas, click here! Wonderful gathering! I was wondering, do neighbor's ever give you all any trouble about your rituals or is it a fairly progressive area? This is my first time holding an outdoor ritual at my place but this is also the same place we've only lived in for 30 days. We have a privacy fence on one side and bushes on the other, plus neighbors never came out while we were out there. I doubt anyone saw or knew what was going on. That being said, the public rituals with Liithi Lushede that I blog about are held at at a park here in the same area. In a year and a half of photographing them, I've never had anyone at the park negatively react to the ritual. In fact, because I'm on the outside doing photographs, I usually get people who are curious about what's going on and want to know more. Other than a single contractor a few years ago who found my blog, I've never experienced discrimination for believing what I believe or practicing in public. It's been very freeing. Kansas City is a lot more progressive than some give it credit for! Where did you find the torches in the elemental colors?? At a very local hardware store. I wish I knew if other places carried them though!